Prices of 4K monitors have fallen to under US$800, finally coming within the reach of users who didn't want to spend thousands on displays. Dell's $699.99 28-inch Ultra HD Monitor is the cheapest of the bunch, while Lenovo and Asustek announced similar-size monitors at $799. The monitors are being previewed at the International CES trade show in Las Vegas, and are expected to ship as early as later this month. This sub-$800 4K monitors could be good news for gamers and creative engineers looking to make 4K content. Some games like Crysis 3, Battlefield 4 and Assassin's Creed Black Flag are 4K-ready, and new graphics chips from Nvidia and Advanced Micro Devices are capable of rendering 4K video. The 4K monitors will display more vivid and dense images with a resolution of 3840 by 2160 pixels, which is four times the current 1920 x 1080-pixel HD resolution. TVs with 4K resolution are already on sale, and an early 4K monitor was shown by Sharp at last year's CES. Apple is now selling a Sharp 32-inch PN-K321 4K monitor, but for $3,595. 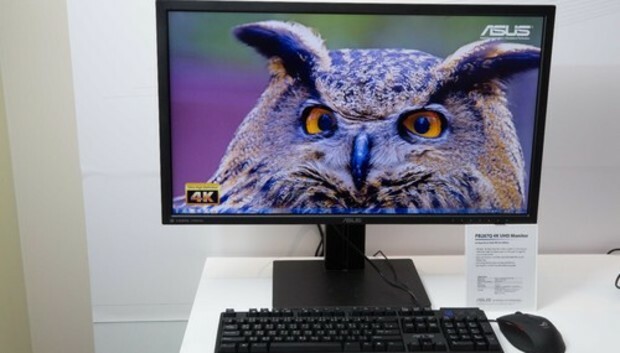 PC companies want to push 4K monitors to the masses. The new monitors have a range of ports, and could also connect to gaming consoles. Dell's $699 Ultra HD Monitor P2815Q will ship worldwide later this month and provides the "best possible screen resolution" for photos and videos, Dell said in a blog entry. It offers depth of 1 billion colors, and has USB 3.0, HDMI, DisplayPort and mini-DisplayPort ports. The monitor has a response time of 5 milliseconds. It also has a speaker bar. Lenovo's $799 ThinkVision Pro2840m monitor will ship in April. It has a DisplayPort, mini-DisplayPort, USB 3.0 and HDMI ports. A stand allows the monitor to be adjusted in multiple orientations. It supports MHL (mobile high-definition link) for display of content from mobile devices and has speakers. Asus' $699 PB278Q has a response time of 1 millisecond for 4K images at 60Hz, which could make it more responsive than Dell's $699 4K monitor. Asus did not provide information on when the monitor would become available. Many new 4K TVs from Sony, Samsung and LG are also on display at CES. Netflix at CES said it will start streaming video in 4K, and streaming video from YouTube based on Google's VP9 video codec was shown on 4K TVs.